I finally had a chance to take in a St. Vincent show in its entirety, last week at Largo, when the multi-instrumentalist, singer-songwriter opened for John Vanderslice before rushing out the door to catch a flight to support the Arcade Fire. In a word, her performance was breathtaking. 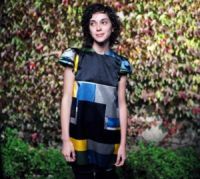 Deftly moving from confessional singer-songwriter fare on the piano, to displaying avante-guard, Zappa-esque chops on the guitar, St. Vincent (Annie Clark) had the audience captivated from the moment she took the stage. Her debut LP Marry Me drops July 10th on the Beggars label and is sure to rarely leave our stereo for the remainder of the Summer. Watch the live videos, and check out “Paris Is Burning” and “Now, Now,” the debut track off the upcoming Marry Me LP. And, really, do go see her perform in an intimate live setting. You’ll thank me later . MP3: St. Vincent :: Now. Now. Wow, glad I downloaded those tracks. She’s excellent. I detect something from The Slip in “Now. Now.” but I can’t really put my finger on it. And she’s a little Bjork-y on “Paris is Burning”. Good stuff.